Following the frankly lethargic 'dog ate my homework’ sounding excuse given by main support James Bay who dropped out from the evening, Florence Welch and her well­oiled machine close the inaugural Apple Music Festival with a contrastingly ruthless tenacity. Opening with ​What the Water Gave Me​, Florence and co charge through an intense, uplifting and triumphant set that dips with equal measure into her three albums to date. 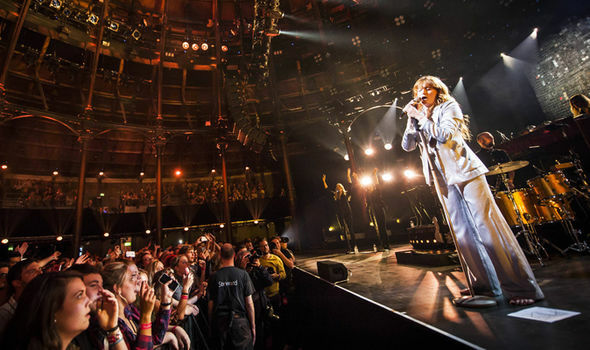 Fresh off her extended run at Alexandra Palace, the Roundhouse seems like easy pickings for Florence as we flow effortless through the 90 minute set, led by an unmistakably slick and self­assured performance from singer Florence Welch. Tonight, we are treated to all the trademark skips, flicks and twirls that we’ve come to know and love from Welch, as regulars Shake It Out ​ ​and ​Ship to Wreck​ trigger raptures from a rammed­out Roundhouse. But with all this, the extravagant wardrobe choices that in the past have distracted from the power and scope of Welch’s voice have now been refined. Indeed, we are now watching an artist who appears coloured and glittered not by her clothing but instead, by the endeavours and beauty of a musical back catalogue that is deeply satisfying. In particular, songs such as ​How Big, How Blue, How Beautiful ​­ which tonight is entitled How Big, How Grey, How Beautiful​ with homage to our London setting ­ profit from the tight, homey surroundings that the Roundhouse provides, as rich brass composition bounces delightfully around the room, indulging the audience with every last textural nuance. Florence is appreciative, endearing and inclusive, with her delicate spoken voice regularly interacting with the crowd, urging us to get on shoulders during ​Rabbit Heart, Raise It Up and embrace our nearest partner during Dog Days are Over​ ​. But for every soft, spoken whisper comes the powerful and commanding vocals of Welch, who grasps hold of the audience’s attention, refusing to let go from the first minute to the last. Naturally, her 2009 cover of Candi Staton’s ​You’ve Got the Love​ produces one of the loudest cheers of the night. But importantly, new material such as What Kind of Man​ ​ in many senses outstrip this reaction, which well and truly underlines the huge steps taken by Florence this year in achieving a third album that has resonated in a big way through, ​How Big, How Blue, How Beautiful​. With the night drawing to its climax, we are treated to a harp­driven rendition of ​Cosmic Love which provides a timely reminder of the raw qualities that were so important in the earlier days of Florence + the Machine in catching the eye. Fittingly, the song is dedicated to Florence’s father Nick, a key figure in the band’s early development. Before a quick exit and re­entrance, Florence launches into the brooding What Kind of Man​ before finishing with ​Drumming Song​, taken from her debut album ​Lungs ​in a night that was always going to provide in a big way​. ​Of course, we’re all aware that Florence has got some serious pipes on her ­ she’s always been able to belt a note or two. 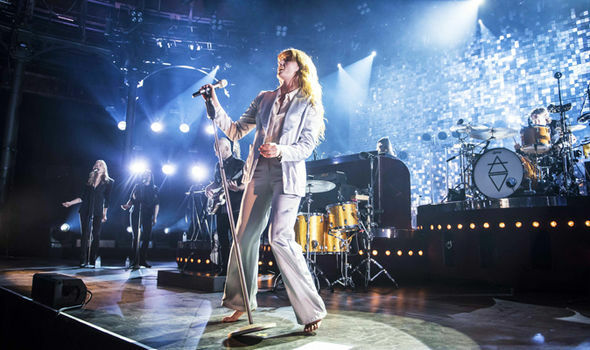 But tonight ­ and over the past 12 months if truth be told ­ there has been an evolution in what Florence + the Machine have to offer; you can feel the raised eyebrows that ridiculed her selection as Glastonbury headliner subsiding with every performance.